As late as the first half of the 1930s, the innovations which led the shift from the biplane to the monoplane airplane designs reached the aeronautical industry in the Kingdom of Yugoslavia, traditionally considered secondrate compared to those of the major European powers. By then, the Vazduhoplovstvo vojske Kraljevine Jugoslavije (VVKJ Royal Yugoslav Air Force) was hopelessly outdated. The core of its arsenal consisted of obsolete biplanes, including the Breguet 19 light bombers, Potez 25 trainers, Avia BH 33 fighters, as well as Dewoitine D1 high wing monoplanes fighters. Due to the reluctance of the long term allies to supply modern equipment to renew the aging Air Force, the Yugoslav government lost precious time by failing to commit immediately to the industrial cooperation with the only other available source at the time, Germany. 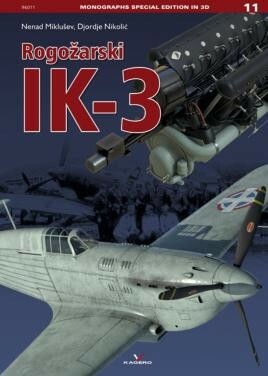 This is a very much complete look at the largerly forgotten Rogožarski IK3. Highly recommended. Superb illustrations and as much historical detail that I think we could ask for. There is an enormous amount of work gone into this one. For the aircraft historian and especially for the modeller I can't imagine you could want for anything more. A great new Monograph from Kagero and the two authors.